Spartacus: Gods of the Arena is now on Facebook. The hugely popular TV serial based on ancient Rome where gladiators fight for their masters and bring honor to their ludus (House). 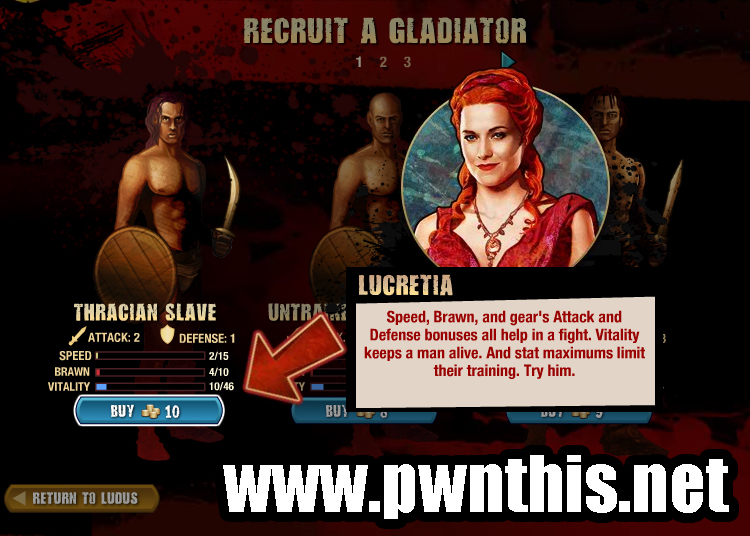 Train and armor your gladiators for bloody battle as you fight your way to glory in Rome's Circus Maximus. * Buy and sell your charges! * Challenge your friends' warriors in the arena! * Make decisions who will live or die! * Based on Starz's hit series! 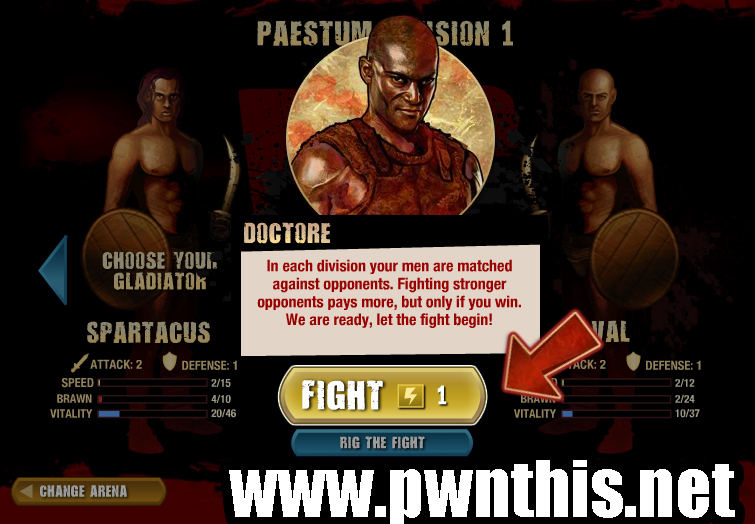 In the Facebook game, you will need to purchase a Gladiator first. Training a Gladiator requires energy. 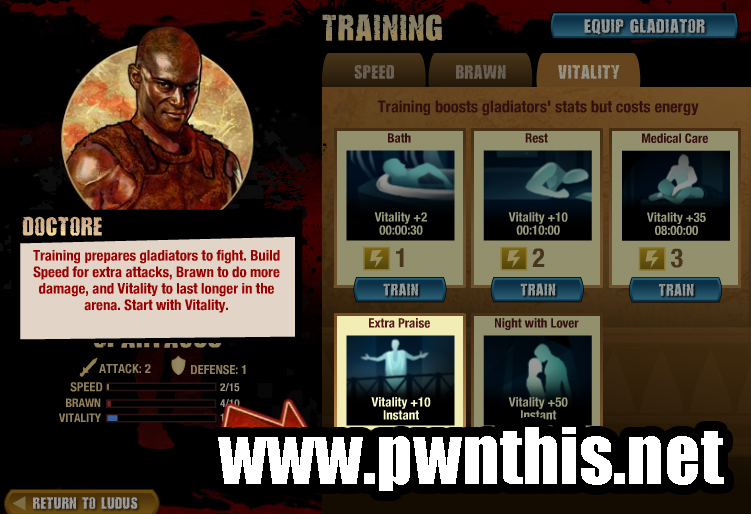 You will need to train your Gladiator in 3 different aspects: Speed, Brawn and Vitality. Only the strongest remain standing in the arena. 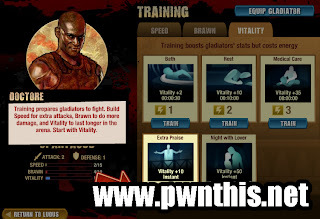 So make sure you train your gladiator before sending him to fight for glory. There are 2 buttons to click during the fight. Cheer which you click on when your gladiator is making the attack moves or Jeer when your opponent is the one attacking. You have to reach the "thumbs up" sign to ensure the crowd is happy and avoid death should you lose the fight. You will lose all your weapons purchased and training done if your gladiator died. So always ensure he survives! You will definitely be invincible if you cheat in this game with some awesome god-smacking cheats. Okay, I do have some cheats that works. Pretty effective for a 100% success win rate at the expense of winning more coins. Will probably post it up if there are enough people who wants it I guess, as my cheats usually gets patched way too soon after posting it up. It's pretty easy so go figure out yourselves with the hint that I have given. I will only spoonfeed if there is a need to. Still playing around with it..